Manutec introduces a new range of aftermarket replacement 21” press wheel tyres to suit John Deere 1820 and 1830 models. Specifically designed to be fitted to John Deere 1820 and 1830 100mm rims, the new press wheel tyres have a high Duro reading. The tyres are designed to operate in Australian conditions as well as reduce through-life maintenance costs associated with these types of wheels. The new gauge wheels offer long life tyre option. 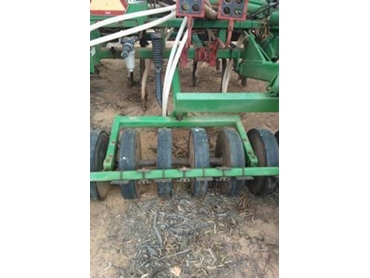 Manutec also offers, for the 2014 season a complete replacement wheel for the John Deere 1820 and 1830 air hoe drills, plus the Flexicoil and Bourgault air hoe drills. The new 16” press wheel to suit John Deere 1870 and Conservapak machines is also now available. The new 16” Mud Razor gauge wheels to suit John Deere 1860 and 1890, and Max Emerge models are now available.